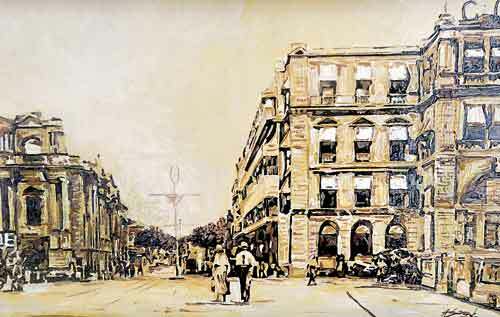 It is an unmistakable roadside attraction in the heart of Colombo, a display of paintings in vivid colours on diverse themes. Green Path has for many years been a hub for local artists who in the absence of a gallery to exhibit their work, display them on the sidewalk in the hope that passers-by attracted by the sight, will stop to take a closer look and perhaps decide to buy their creations. Here you will find both established artists who have been in the arena for many years and young aspiring painters who are exploring new forms of art. 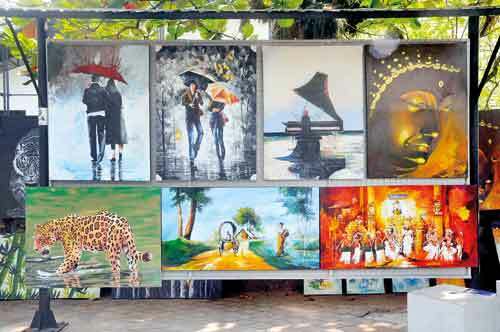 Last month, recognising their need, 25 permanent road-side shelters were erected by the Provincial Councils and Local Government Ministry for these artists to display their paintings, a move that has been greeted with much enthusiasm by the artists. Malinga Perera is a young painter whose father K.D.H. Perera first arrived at the Green Path roadside 16 years ago. Malinga recalls how they would have to hastily cover the paintings with polythene when it rained due to the absence of proper shelters and how the paintings were sometimes damaged in the process. One of the earliest members of the Green Path artists group Neil Kumara, from Negombo, who can turn his brush to abstracts, landscape and portrait art is appreciative of the panels as now they could have a proper display of their paintings. A veteran artist among the group, Sarath Yatawara came to be at Green Path when the local film industry moved on to a digital era. He has drawn more than one hundred film cut-outs which were on display outside the cinema halls at that time but found that his work was no longer needed. “Me galleries dipu eka nam pinak (giving these galleries is an act of merit),” says Sarath adding that earlier they used to hang their paintings on the roadside railings. He also suggests that if the artists were given some kind of a roadside locker to store the paintings safely it would be helpful as transporting them every day is costly and sometimes the paintings are damaged in transit. 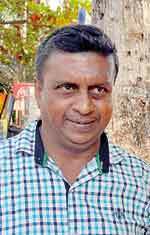 Mohan Senadeera is a young artist who joined the group in 2004. He is an expert in portraits and some of his paintings of well known politicians are on display at Parliament. “Dan apita pavement eke innawa kiyala hithenne ne (We do not feel like we are on the pavement anymore),” he says, – the shelters having given them a sense of respectability, he feels. The better display has increased their demand as well. A painting could be priced more than before when they were just hanging on the fence or propped up on the pavement. “We want to promote the concept of ‘free space to admire art’among the public,” says A.C Nuwan, president of the Open Air Art Gallery. space for mental relaxation, for people to admire the art free of charge while artists earn a living at the same time,” Nuwan remarks. The members of the society are also issued an ID. “All this time people saw us as pavement artists. The panels have given us and our paintings recognition,” says Nuwan. Lakshman Dissanayake who uses the technique of wood burning (pyrography) has high hopes that they could turn Green Path into an ‘art lane’. “This Green Path is a breakaway from the stereotypical concept of a gallery – a confined room with paintings, to a free open space for all spectators,” he says. Chaminda Bandara, an art teacher who graduated from the University of the Visual and Performing Arts in 2009 draws birds, but with a difference. “It’s a form of modern art which we were taught in campus – to look at some object and to recreate it in your own way,”Chaminda explains. 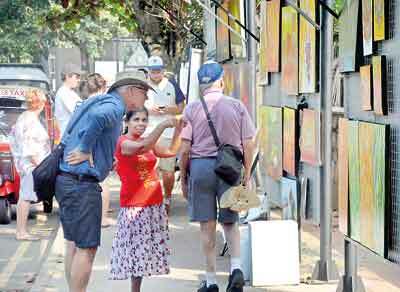 “But Sri Lankans never buy such art thinking they are children’s drawings,” he adds laughing. He perceives the roadside galleries as ‘a good thing’ and also suggests that the tourist travel planners should include Green Path in their tour schedules. On the whole, the roadside galleries have served the Green Path artists well, and when the George Keyt Foundation holds its annual Kala Pola bringing together artists from all over the country, this is their venue of choice. The Green Path artists would also prefer more recognition all year round and the patronage of the relevant authorities to promote the idea of art and leisure where people could come and enjoy a stroll here while appreciating the works on display. British curry kings here to give us curry!